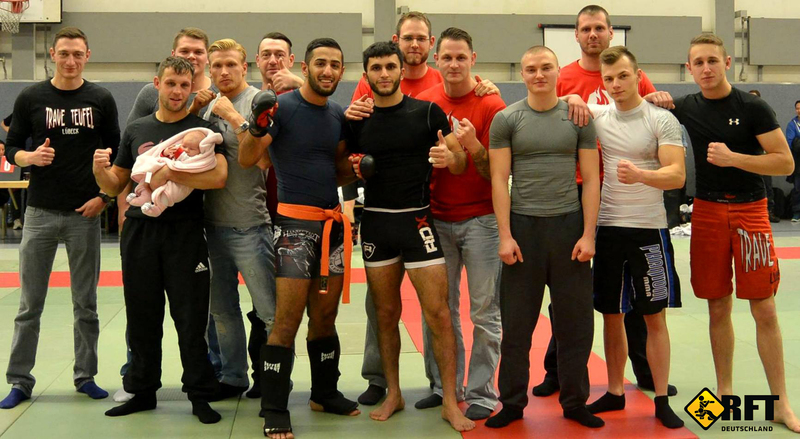 Last Saturday on the 24th of November the Gi and NO-GI Allkampf tournament was held in Hamburg, Germany. The event was an open tournament with Poolsystem, two rounds with 2 mins per round, wearing shooto gloves and shin guards. Full contact to the body, light contact to the head, Submission holds and ground and pound was permitted. All together 77 Teams were registered for the tournament. Six athletes from RFT Team Lübeck were nominated to represent RFT Luta Livre on the day. Two first places were secured by Farrukh and Schewan. Additionally, Schewan was awarded the trophy for the best technique. Florian and Pascal both reached the third place, Fabian was disqualified as he accidentally knocked out his opponent and Daniel had a very hard start being unfortunately not able to reach the podium at this time. Andre Deponte, the trainer of RFT Team Lübeck said "I am very proud of the results. To see under a competition situation the successful execution of the specific teaching of our RFT Deutschland Head Coach let me and my team feel very confident in what we do". Nico Welko, RFT Deutschland Head Coach tells "We continue adding results to our teams, and that is only possible because of the dedicated teamwork of our responsible trainers and athletes" further he continued "It was an appropriate date to make checks of some aspects of our athletes, as we are and remain a team with a competition culture". More tournaments are targeted for RFT Deutschland for this and next year. That being under specific Team's cadres nomination.